It’s been a busy week at Agents of Field HQ. The house has been full of builders (we’re not onto the new kitchen just yet, but hopefully it’s not too long before we can get started on that! ), our new garden shed arrived, Ade’s been dashing back and forth to London at the crack of dawn to guest present on the QVC channel, we’ve just started featuring on BBC Radio Suffolk who will be following us over the coming year to see how our attempt at living ‘The Good Life’ progresses, and (drumroll, please) we did our first ever live event. Hence the silence last weekend. Apologies for not blogging, but things have reached new and unexpected levels of chaos in our household. Look, there’s even a cement mixer in our living room. Anyway, we were delighted to be asked by Ellen Mary to talk to her No Fear Gardening group at the fabulous Gin Temple in Norwich on Wednesday about our grow-your-own journey. Despite being thwarted by technical failures which rendered our presentation completely unplayable (hence our panicked faces above), we somehow managed to talk for an hour and met all sorts of wonderful green-fingered and homegrown-foodie-loving folk, as well as sampling some of Norfolk’s finest gin. Yes, Norfolk, it transpires, is a hub of artisan gin-making activity. Who knew? Back home, the kitchen garden has really started to take shape. The greenhouse is up, as you know, but the arrival of the shed this week has made a big difference. 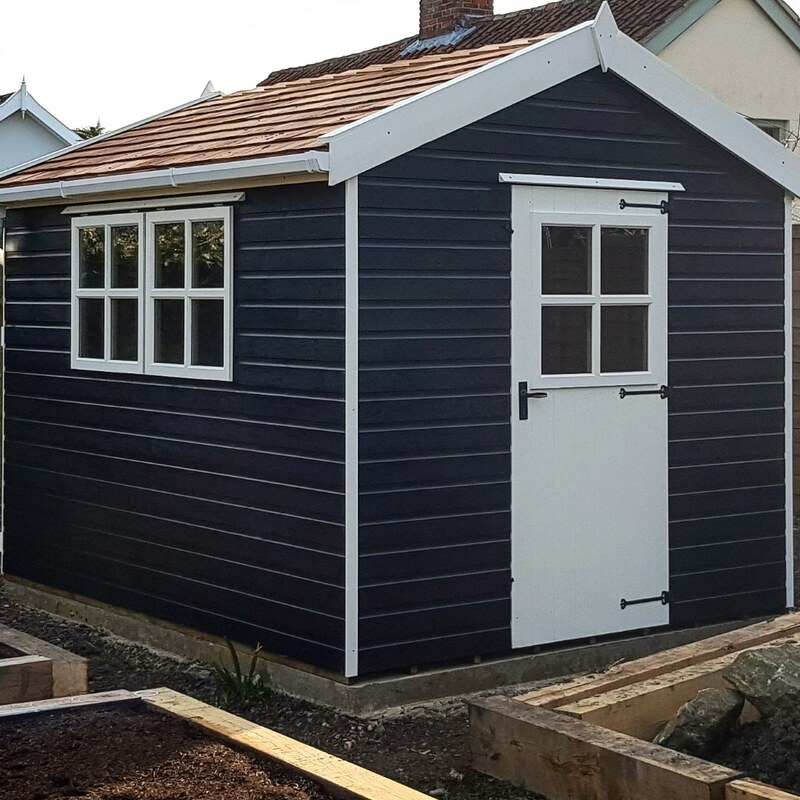 I was quite surprised when Ade said he’d chosen a black shed as I thought it would look a little sombre at the bottom of the garden, but with it’s white trim, cedar tiles and Georgian windows, it’s one of the prettiest sheds I’ve seen in my life. It’s a bit like a doll’s house really – not sure that was quite the look he was going for! We’re on from about 02:07 in both shows, and they should be available online for the next month or so, if you fancy hearing what we’re up to. Luke will return to our garden in a couple of months to see how we’re getting on. Hopefully, we might actually have some veggies growing in our raised beds by then!